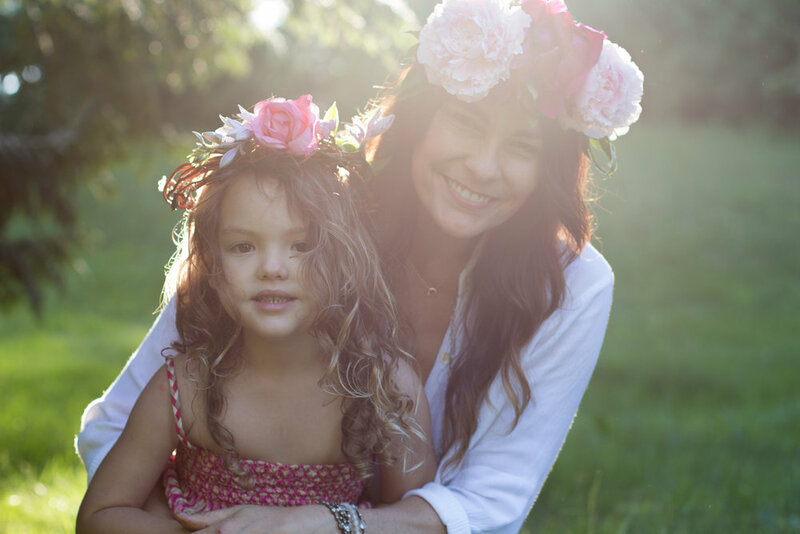 I'm Melissa Blyth, founder of La Luna Mama. I believe that when we develop a relationship with our most authentic self through deep self-care, when we shine our light and be our most powerful Selves, when we tell our personal HERstory, we create an environment for our children (and the world) to do the same. The youngest of 5 children born during the 70's "flower child era", I am a nature girl at heart and a rebel soul. I was never one to conform to the way things “should” be done, and have always carved out my own way of living life (usually at great odds with convention). My nickname growing up was Missy or Mis, or as some would say "mis-chief". Music was at the core of everything my family did, and song (and lyric) became an integral part of who I am. Small-town living in Southern Ontario gave me the deep roots of family, community, and a reverence for the natural world. I believe though, that it is my Metis ancestry that truly connects my heart to this earth and everything that is ancient, sacred and mystical. In my twenties the West Coast beckoned me, and that is when I first touched the sweet earth and salty sea of Vancouver Island and met my amazing husband. I left a career in health sciences and plunged into the world of entrepreneurship, completing my Bachelor of Commerce in Entrepreneurial Management. In my thirties a lust for wandering took my husband and I to Europe, Asia and the South Pacific on a round the world ticket, but it was the call of London that had me lay down my roots and dive deeper into yoga, life coaching and photography. It was during an all-night Summer Solstice ceremony at Stonehenge that the magic of my historic homeland (where my ancestors originated) opened up to me a whole new world of the metaphysical. The fact that England just also happened to be the birthplace of my childhood hero John Lennon, was simply just icing on the proverbial cake. An early obsession with the spiritual life and philosophy of the Beatles had me captivated and intrigued about music and mysticism from the time I was 10 years old. The West Coast seduced me back, and this time I landed in the hometown of my dearly departed dad- the enchanted city of Vancouver. I was in my late 30's when we received my father's diagnosis of terminal cancer, which proved to be the pivotal moment that changed the trajectory of my life forever. It became clear to me that my path in life was health and healing, sharing and educating and above all else, becoming a Mother. The past 10 years have revealed to me how serving others is the highest vibe of all, and how Motherhood is the most profound journey to Self. Being a mother to a highly creative, sensitive, intelligent and wise soul has hands-down been the most transformative, heart-opening, joyous, victorious and perspective-giving experience of my life. I cry at everything. I love so hard I can barely breathe. Every day for the past 5 years, I have laughed, sang, danced, created, cried and suffered more than I have in the past 47 years combined. Living with a little person who commands an ever-deepening level of presence from me is the most precious gift of all. My parenting journey has not been an easy ride, but it has been the deepest and most fulfilling one by far. I give thanks to all of my teachers in yoga, meditation, music, ayurveda, healing medicine, photography, parenting and mischief. I bow in deep gratitude to the sacred journey of Motherhood- continually taking me deeper into love. The Motherhood coaching I offer aims to help you break the stress cycle and create a more joyous mindful Motherhood journey. It incorporates mindfulness technology in the form of yoga, pranayama (breathwork), meditation, and parenting support. ONE DAY SHE BECAME A MOTHER TO AN ANGEL WHO LOVED TO SING TOO, AND NOW THEY MELLIFLUOUSLY SING TOGETHER IN THEIR MAKE-BELIEVE WORLD.